The Mani is a sea-swept peninsula in the Southern Peloponnese, stretching down from the rocky spine of the Taygetos mountain range to the southernmost tip of Balkan Europe. Terraced olive groves reach high up to unimaginably remote villages, and hidden coves offer secluded swims in both the Ionian and Aegean seas. In autumn after some rain the mountains suddenly burst into flower with cyclamen and autumn crocus, contrasting with the stony grey of the tower houses which are particular to this region of Greece. Varied and often challenging walking combined with Byzantine chapels, classical remains and caves reveal a side of Greece which remains largely undiscovered. Restored stone guest house, Petrounis in Areopoli. This itinerary includes direct flights, private transfers and tours, accommodation in standard rooms and all meals included as well as wine with dinner. Guide price per person £1,980 based on 2 people sharing (single supplement of £220). Note. This trip runs with a minimum of 6 and a maximum of 12 people. The walking is quite demanding throughout. Parts of the walk are steep - both up and down, and on occasion the tour gradually ascends 750 metres in a day. On most days, the walks can be divided up into sections, so that if you decide that a whole day is too much, then it is possible to join just parts of the walk which suit your personal ability. Direct flight from a UK airport to Athens International Airport. 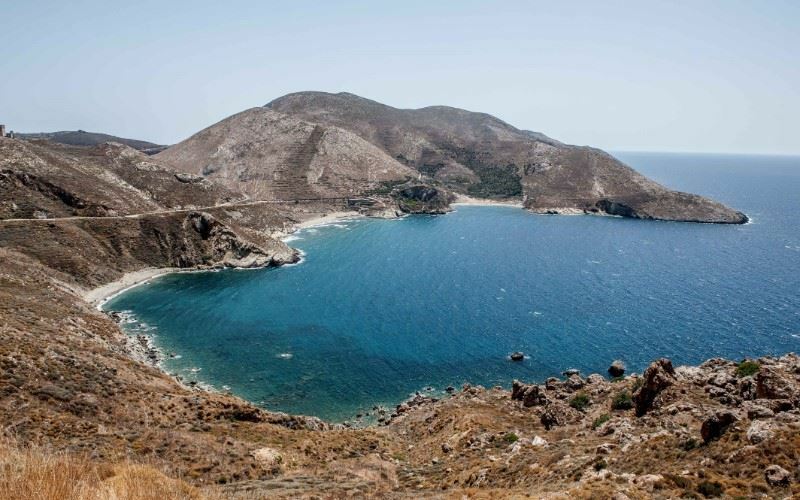 Then on arrival you will be transfered on a 4 hour drive south to the traditional village of Areopoli, capital of the Mani, which will be the base of your trip. Overnight at Petrounis in Areopoli. We drive to the northern side of Cavo Grosso, and walk out on a rocky spit to visit the remains of the sea-swept Castle of the Maina. We then retrace our steps and take a detour along the cliffs to visit a charming monolithic byzantine chapel. Here we can enjoy our picnic with one of the most beautiful views in Mani. (5 miles) The afternoon is free for you to fill as you choose: another short (guided) walk which would include classical remains and an interesting chapel near a pebbly beach, or simply some time to wander around in the the village, or read on the terrace. Transfer to Athens International Airport for your return flight to the UK.